The Straits Times, Singapore’s leading English daily, recently devoted its entire Sunday Lifestyle supplement to covering a phenomenon which seems to be becoming a rage in Singapore. 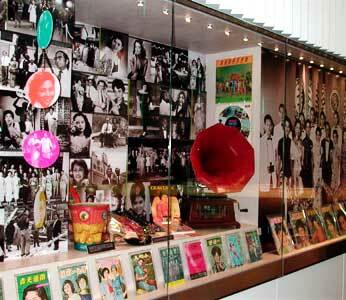 ‘Nostalgia’ or the need to relive the past is a disease that seems to be afflicting more Singaporeans than is usual. In fact so big is the phenomenon, that one can almost call it a mini industry of sorts in this city state. It has many avataars – retro/vintage/60’s or 70’s hip/40’s-50’s art deco/classic- and it finds many manifestations- retro theme parties, quaint looking eateries, retro designs for buildings and offices, activist groups campaigning for the preservation of historic buildings and their facades, retro furniture shops, nostalgia themed collections/looks by designers to even the National Museum putting up era specific memorabilia on display and publishing a book on Vintage Singapore. The most popular destination in Singapore currently, The Cathay Picture House (Most popular destination for online Singaporeans – MPulse November 2006), has also been through a recent makeover which highlights its art deco façade instead of a swanky modern contemporary look. The New Majestic Hotel, recently renovated similarly, is one of the hippest destinations in Singapore. In fact, even our Mindshare Singapore office has a conference room done up in mosaic sixties style!! So what lies behind Singapore’s yearning for the past? Is it merely nostalgia, which can be found everywhere? Or is it something more, something to sit up, understand and possibly learn from? For Singapore, a city often accused by the world of having no soul, this could perhaps be an attempt to discover what it is really about. The current generation is perhaps increasingly trying to bring back and understand the past to decode the character of the present. According to a sociologist quoted in the aforementioned Sunday Times supplement, ‘People tend to have a kind of selective amnesia about the past. Not only they remember it, but they also embellish it and make it better than it really was’(Chua Beng Huat, sociologist, Sunday Times, Page L3, 18th February). Therein, perhaps, also lies the key to the phenomenon’s marketability and it’s appeal to businesses. It is no surprise then, that an informal estimate by the same publication pegs the investment in recreating the past at SGD 20 million. Little surprise, also then, that brands with histories like Coke and Levi’s do not hesitate to jump on to the bandwagon by cashing in on the iconic equity of their older products/packaging. It is therefore, definitely more than merely a rose tinted view of the past. What lies at the bottom of this is a need to find meaning, personality, character in things. So what is it that we, as media and marketing experts can learn from the nostalgia story? An interesting exploration to be made here is perhaps the extensive debate about the irrelevance of old media like newspapers and TV, which seem to be fading in importance especially amongst the youth as remnants of a time which is past. But these same youth are also the ones buying into ‘retro’ fashion, which they may not even have been around to see. Something, which on the surface seems to be a passing fad, actually has more depth. Take for example, the popularity of LPs in the world MP3 players and other extensive digital format options. There are young people who still buy into LPs because of many reasons, the superiority of content quality being an important reason. The feeling that you own the piece of music and have a personal relationship with being another, and the feeling of having something tangible in your hands. This analogy is important to illustrate how and why old media like newspapers may never go out of business. In a world where information flow online is completely uninhibited and undoctored, information almost controls the individual…take the example of any website which you would visit. The possibility that the website takes you somewhere completely, through links that take you to other links, which take you even farther, from where you started is very high. There are people who feel lost on the net there is an overwhelming sense of loss of control. They also doubt the source credibility of it. Such people prefer printed words on pages. For them the printed word on a newspaper has much more veracity than a random website on the net. The argument of tangibility also holds. The need to own a book which you love is huge for readers. Opening the book, whether new or old, and smelling its pages, is in itself an act establishing a relationship with it, as is reading it again and again. For some the print medium has meaning beyond mere information. These people store collections of magazines like Vogue and National Geographic. There are people, in fact, who frame poems and put them up on the wall. According to Colin Faulks, designer in residence, at La Salle Arts College, the print medium appeals to subconscious parts of us. Elements like the smell of ink, the need to hold what you read and feel some sense of ownership over it, the almost ‘organic, hands on feel’ that reading words on paper gives us, and the ability to touch it are all the qualities that may ensure the survival of this medium in this electronic age. He feels the reason why after moving from the scroll format to the present book/magazine/newspaper format, we have not evolved any new forms of print is the appropriateness of it, which has not faded. Media owners will probably have to gear up for a future in which reading newspapers becomes a statement of sorts, and the medium itself evolves to a specialized niche one which stands for information of a particular kind. Its audience will then also be a niche one, allowing more focused targeting and high value revenue rather volume revenue. What meaning will it hold for the reader and what kind of reader will it appeal to? One can only surmise but a reasonable guess is that similar to people who are passionate about music and prefer hard formats to soft ones, this will appeal to those who value the written word, those who take pleasure in reading, to discerning readers who value things like good writing, skillful use of language and informed opinions. The newspaper has always carried, with its black and white print, no nonsense layout, the use of older serif fonts, carried with it gravitas and authority. News in the newspaper (the main newspaper) stands for a detached, impersonal, and rational point of view. It stands for a sense of order and control, an explanation and guide to the chaos around us, and what asserts this is the intellectual rigor that goes into the writing of it. This sense of order in chaos may become even more valuable in the miasmic chaos of information that is the internet- undoctored, unmonitored, unverified and uncharted. Many young people look to the newspaper as the most credible source of information, even though they may not refer to it on a daily basis. It is likely then that this deeper coded unchanging meaning within newspapers will still remain and fulfill a need for this ‘kind’ of content…and spell a clearly demarcated future where each medium fulfills a different kind of need altogether. Entry filed under: content, media general, singapore, trends. Possibly further evidence that the medium is the message and we’re drifting towards an analogue and digital media divide, with the wealthy consuming analogue and digital for the rest of us. That’s film photography, vinyl, print and cinema for analogue examples. Lastly I’m always surprised why Singaporeans don’t shout a little about how complex and rich their communication codes are. The island may have dumped anything of hisorical value in it’s race to be a first world entity but there are other fascinating new seams of 21st century culture out there. But is nostalgia the only thing rocking the Singaporean boat? Not if Miss Izzy is to be believed!